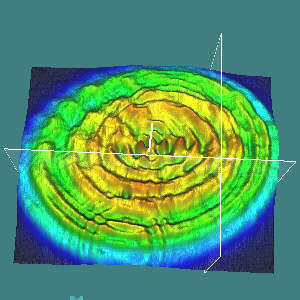 Introduced by ScienceGL Inc., 3D Laser Beam View combines power of 2D and OpenGL based 3D visualization. With newly introduced support of USB 2.0 and FireWire interface our software became the most flexible laser beam analyzing solution. You can get any CCD / CMOS camera of your choose and easily combine it with our software. 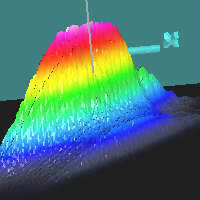 3D Surface View has inherited advanced visualization capabilities of OpenGL, i.e. the most realistic interpretation of light, material, color, reflection, etc., which gives the surface a real look. Among the other advantages of the 3D visualization important is the possibility to analyze fine structure details of the surface. On image left one can easy notice a line the lower sensitivity line, resulted from incorrect calibration of the imager. 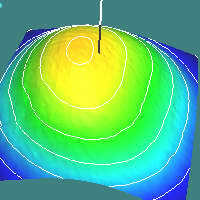 Topographic coloring of the surface using Look Up Table (LUT) is a common way of beam topography visualization in 2D domain. 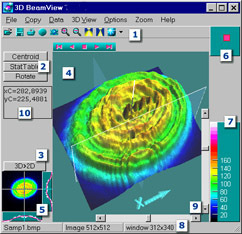 3D Beam View gives you additional shadow and reflection facilities. Surface color map as well as background color are selectable from default or user defined gallery. Optimized algorithm provides real-time zooming, scaling, rotation, animation without loosing much quality of the 3D surface. The effect of compression can be also considered as low-pass filter. Topographic surface of a Diode laser beam. 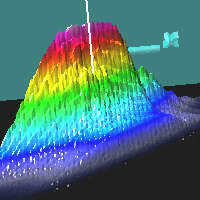 Texture revealed with correct lighting correspond to pixel-to-pixel noise. Light direction adjustment in 3D space. Beam fine structure is better visualized at certain angle of incidence (see example left). Centroid, power, ISO knife, ISO slit, ellipse, Gaussian true least square fit, etc. Parameters can be averaging over several measured frames. CutView is designed for fast surface profile inspection. 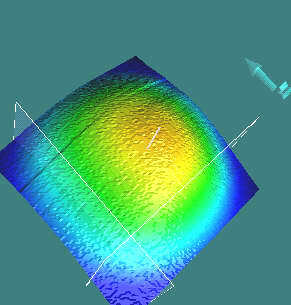 It shows intersection in real-time making easy to analyze beam surface detail. -VB-script, data exchange via network/internet, etc.